Do you have books coming out of your gills like we do? We have collected so many books in ten years of homeschooling, it is getting hard to keep track of which book belongs to which year of study and which books each child has read. Timeline of Classics is a great solution for that (wonderful) problem. Timeline of Classics is a listing of classic books according to the historical chronology of their setting. Beginning with ancient times, Gail lists fiction and non-fiction classics that will comliment your studies. Each book is labeled according to historical time period, age level (elementary, middle, highschool), and author. I’ve purchased a few attempts at this type of listing in the past, and the result has been a huge and unweildy volume that never leaves my shelf. Timeline of Classics is organized in a simple, streamlined, easy-to-use format and is not even an inch thick. I was actually shocked at the simplicity of the layout for conveying so much information in a small space. The list still contains more books then any single person could read. 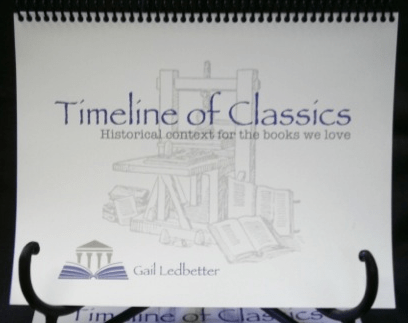 To use Timeline of Classics, you scan the list for the time period you are studying and highlight several books you would like your child to read. Older children can choose for themselves. Head to the local library or bookstore and find books directly from the list. As your child reads each book, they can add a time and date of completion next to it in their personal copy. Over the years, your children will develop a complete record of the classic literature they have read. This will prove invaluable on a high school transcript and become a treasured keepsake encompassing many years of their schooling. You could actually organize all of your history and literature studies from elementary through highschool using Timeline of Classics as your single guide. Timeline of Classics can be purchased spiral bound ($29.95), as a pdf download ($16.95), or as a cdr ($19.95). If you have multiple children, you will want to purchase the pdf and be able to print out multiple copies, and extra single pages when one page accidentally gets messed up. My Bottom Line: I think this Timeline of Classics is a very helpful tool and a great value. We will be using this in our home. I highly recommend this book, especially for large families and those using a Literature Rich method. You will get lots of use out of this book. I am very interested in the huge and unwieldy volume you reference in this post. It just might be what I’m looking for and have been unable to find. If you read this could you please email me and let me know the title, author, and publishing information? I would really appreciate it. I’m a homeschooling mom also. Thanks for your review here.